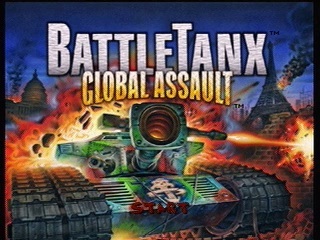 Created by 3DO and released on August 31, 1999, BattleTanx: Global Assualt is the direct sequel to the original BattleTanx. The story revolves around a deadly virus that killed 99.9% of all women. After Griffin Spade, Battlelord(maybe you've heard of him? ), saves his kidnapped wife in BattleTanx, players follow Griffin and Madison's journey across the post-apocalyptic world to save their son and stumble upon the conspiracy behind the virus. BattleTanx: Global Assault gave fans more of what they wanted: more gangs, more power-ups, more levels, more multiplayer options, and most importantly, more tanks. Unfortunately, 3DO went out of business before they could release another installment. Dylan: This is an especially frustrating level. The enemy AI is inconsistent, and aiming accurately in this game is fairly difficult. I do miss a shot on the Inferno on the docks, but I'm able to hit every one of my shots after that. Tom: I swing about in the begining to pick up some swarmers. I make 2 mistakes this level: hitting some tank scraps and shotting swarmers which are slower at the alive FLP-E instead of the Abram's main gun (this makes sense if you watch the last few seconds of gameplay). Dylan: Mototanks would be ideal for this level because of their speed, but we only have access to Abrams at this point. Because only one person is needed to touch the lander to trigger the victory screen, two people rushing towards it at once doesn't accomplish anything. The guided missiles Tom hits me with give me a pretty big boost of speed and is 2 seconds faster than if you were doing this solo. Dylan: I decide to use an Abrams because mototanks take too long to destroy bunkers and there are no items that are easily accessible on my side with the exception of the swarmers at the end. It is true that I could have destroyed the final Hydra quicker, but it does not matter because the Hornet that Tom is waiting for spawns after a certain time and is not dependent on any other tanks being destroyed. Tom: I use the Mototank here because there are swarmers along my route I can pick up. The hardest part about my side is right before the first 2 bunkers I have to kill enemies that will spawn and they just wander around randomly. My main mistake would be that I wait a bit to fire a swarmer at the first hydra, and not hitting that turret is very difficult because of this games terrible hit-boxes. Dylan: I really don't have much to say about this level. Tom gets the prisoners that are farther away because he spawns closer while I get the others. My execution could definitely be better, but because my part ends up finishing at the same exact time, his execution is all that matters. Tom: I fire some bullets after I pass the gate to get the building down one level. Also, firing bullets mid-air will cause you to slow down because of something the game decides so I burst my shots. The swarmers I pick up was just the game being nice. I changed my original route with the help of an incomplete TAS vid on youtube (from emu2000). Dylan: Early on I discovered a trick where machine gun bullets from Mototanks and Rattlers can travel through walls if you're pressed up against one when firing. The game wants you to throw grenades over the wall at the projectors, but this trick saves a bunch of time. The reason Tom doesn't have to go inside his drive-in while I do is because the projector inside my drive-in is surrounded by walls on all four sides. So if you were to try and shoot through the outside walls of my drive-in, there would still be another set of walls around the projector itself. Tom: So I don't do jack this level. I sometimes grab the turbo to the far left for funsies but I didn't when we got this time. I hit the turret and it looks bad but it doesn't waste anytime on the level and Dylan really wanted to keep the time. Dylan: We absolutely played the hell out of this level. I fire two lasers from the center of the map to completely destroy the building Tom's data disk is in, thus saving him the time from destroying it himself. I wait an extra second or so after firing the first laser before firing the second one because the way buildings are destroyed in this game is rather odd. When you do enough damage to a building, it burns down one story. If you do any more damage to the building in this burning down phase, the building doesn't actually take any damage. So you have to wait for it to completely burn down that one story before damaging it again. The building I was supposed to hit was very small, there were a group of about 5 or 6 mototanks a hundred feet in front of me that were in my line of fire, and not to mention I was already firing from halfway across the map. Needless to say it took countless retries to do it consistently right. Unfortunately, I bump into a tank on the way back and lost like a quarter of a second. Dylan: My role in this level is to clean up anything that Tom's nuke won't finish off. I use the edge in an area where there are two Abrams. The edge isn't able to convert enemies to our side at this point in the game, but it does a little damage to enemies when it hits them. Normally these two Abrams would survive the nuke, but the damage from the edge weakens them enough to be destroyed by it. I destroy the bunker in the corner because it is usually outside the range of the nuke and I get rid of the Annihilator because it would obviously take little damage from the nuke. Tom: I love this level for the sole fact that I get to use a nuke. To the best of our knowledge there is no other way to get it without turbo. The turbo I grab is probably one of the most difficult turns I do in this game because walls will cause you to lose velocity instantly and are sticky. That jump is also stupid because the ramp is uneven and going off at different parts will cause you to go in wildly different directions. This usually isn't a problem but I have a building I need to dodge while making the jump. Fun Fact: The game has such a crazy bouncing mechanic for these larger than car mototanks we drive that it's entirely possible to hit the wall and bounce so far back you miss the area with the nuke. Dylan: Oh my god. This is the hardest level to speedrun and our routes went through countless changes in the months leading up to its completion. The minefield leading up to my second prisoner is extremely precise to navigate through so I'm very cautious in doing so. On the way back, I try to bounce off a building but the game trolled me and sent me back at the wrong angle. Not a big deal though. Tom goes through his section beautifully so my cautiousness and mistake don't waste any time. Tom: My side could be better but it would be tough to improve it. Ever since Dylan and I started this game I wanted to find a cool glitch and I did with this level. Idk if this already has a name somewhere but I think Dylan wanted to call it the "False Reverse Tunnel Cancel". It has something to do with the floatiness of mototanks and the bad design of underground ramps in this game. And the second glitch I do, the one where you jump over the side rail, is one that Dylan found on youtube (berkanengin). Fun note, when you are oob underground its possible to go through a ramp and get crazy height. One of the runs I did it prefectly so that I jumped over the middle section instead of having to go around. It's a very inconsistent strat so maybe some time in the future we will retry it. Dylan: This level is similar to Escape from SFO in that one simply has to reach the trigger at the end of the level as opposed to destroying or collecting anything. There really isn't anything that Tom could do to help me. A Mototank is faster than a guided missile so missile boosting wouldn't help. Not to mention the missile would kill me anyway. And there aren't any walls or enemies in my way that I can't already deal with. I use the edge in the beginning to stop a Rattler from blocking my way. The small concrete walls can't be destroyed by shooting them so I have to run through them. Tom was getting food during this. Tom: *munch munch* yeah that sandwhich tasted pretty good. Originally we thought I could blow up the first wall under the bridge with a guided missile but mototank is just too fast for that. So instead I just left Dylan to it. Dylan: We initially thought that using dual Goliaths would be the fastest way through this level. But the Rhino tanks always gave us problems. So I decided that I would handle 6 of the 7 Rhino tanks with an Inferno while Tom dealt with everything else. Also it should be noted that the Edge is still not able to convert enemies to our side in the campaign yet. Something must have glitched when Tom fires his swarmers at the Annihilator. It does way more damage than it should have done. Dylan: This is a pretty cool example of teamwork. Tom shoots me in the beginning to give me a boost of speed. I go straight for the green base to give Tom time to damage Red's building. Tom: My side is a lot shorter than Dylan's so we came up with something I could do to help him out. First, I shot Dylan to give him a pretty nice boost. Second, I grab guided missiles and shoot the building housing the scientist. After that I just run and get my guy and head back to the base. Dylan: Very difficult and unpredictable level: enemies not spawning in positions they should be in, getting bad edges, hovertanks from the bunkers going all over the place. There is some hesitation in a couple of my shots early on where I could have been firing faster. I use the turbo to kill the Rhino tanks. Tom's route and execution are absolutely beast. Tom: I try Dylan. I fire off shots in the begining to try and hit a hovertank but he's not always there. My turning is actually the worst part but the luck with the enemies goes such a long way for a good time. The only trick I really use is laying down super mines to kill the rhino or anything really I miss. I miss a shot on the Annihilator but the grenades are what really kill him. Dylan: We use the "fire through walls with machine gun bullets" glitch to destroy the building under the Eiffel Tower right from the beginning. We also use a trick where we pause for a bit right when the screen goes white from the nuke and it causes the victory screen to come up prematurely, thus saving 4 seconds. Tom: We would use Mototank for this level but for some reason its unavailible during this particular mission. Dylan: Convoy level. We're pretty much at the mercy of how fast the convoy vehicles move. In our practice runs, we got 1:31 countless times. Somehow we pulled off a 1:30 so we decided to keep it. Tom: Getting the 1:30 was pretty much the entire reason we kept the level. We tried so many different strats but none of them really made a difference. And we've gotten cleaner runs but they always were longer. Dylan: I blow up the mines in the beginning with an Abrams so that Tom has a clear shot back to the convoy vehicle. Surprisingly, that's all I have to say about this level. Tom: So I get to do the cool thing yet again in this mission by running through the minefield. The bouncing off the wall is safer than trying to perfectly pick up the kid because momentum in this game is ridiculous. Dylan: Another convoy level. Again, not much we can do about the final time. Just make sure that nothing blocks the convoy vehicles' way and that at least one of the front two convoy vehicles makes it to the end. It may look like the convoy vehicles are waiting to move as we choose our tanks on the tank selection screen, but that's not the case. The convoy vehicles are programmed to not move until a few seconds in. Also, using the FLP-E's special to flip into the back of the convoy doesn't do anything, it was simply a potential strategy that we came up with and we just use it for fun here. Tom: Yeah so we tried to have fun with FLP-E tanks this mission. That's about it. Dylan: This level seriously has some of the stupidest spawns in the game. My job is to take out a couple of boats outside of the reach of Tom's route and to start the hell that is the hornet spawns on the dock. Basically the game puts 4 Hornet spawns in the same location and they spawn at what are essentially preset times. There are huge periods of time in between the later spawns and it causes the level to be extremely long. As far as I'm concerned, this is the fastest that this level can be completed. Tom: Pretty bad level, maybe our opinion will change when someone can explain how the spawning system works in this game. The edge I use in the cave is in the right spot to hit everything, most of the time. Also, that boat I turbo out to kill doesn't even always spawn there. Sometimes it spawns near the end of the dock where Dyaln is waiting to kill a hornet. Dylan: This is a level Tom and I were dreading to do since the beginning of the run. One would think that having two players would speed this up significantly but that's not the case. The tanks spawn from the landers at essentially preset times, so killing the tanks as fast as possible really doesn't do much. So if you're saying that we could have had better aim or done something faster, it really doesn't work that way. If you don't believe us then go try and speedrun this level yourself and compare your completion times with your play quality in each attempt; it's completely inconsistent. We've done this level with much better execution and gotten slower times. That said, 9:10 is the fastest we have ever gotten and we chose to keep this run of the level because of the final time and not necessarily the execution. It defies all logic. We tried everything we could think of to see if it would speed up the level but nothing did. So if we could see one thing happen to this game speedrunning wise, it would be to have somebody glitch the crap out of this level and get an amazing time. Tom: Please just fast forward through this. We couldn't find any way to make this faster or to somehow glitch the level. If you really want to know I just sit and take care of the 2 landers on the right and the gun buddies kill the middle lander and Dylan takes care of the far left lander. I've done this level before with only missing one shot and we got a slower time than 9:10. This level makes us so mad/sad. Dylan: We originally decided to use hovertanks on this level due to their balance of speed and power. An optimized run of that route yielded times around :33. We then thought about using rattlers to fire through a wall and kill Cassandra without having to travel to her. At this point we learned about a limitation of the "fire machine gun bullets through wall" glitch, and that is that shots fired through walls are significantly weaker for some reason. Even with radar to make sure we were hitting her, it took us a much longer time to kill Cassandra than anticipated. We then discovered that the victory conditions for this level were messed up and the level could be beaten without defeating Cassandra. This trick basically involved having a certain amount of time passing and then one player dying and respawning (Only tested in co-op, may not be possible in single player). This could be manipulated through where the other player traveled within the level. Unfortunately, this method optimized ended up with :35 as a fastest time. This trick does not work on any other level. We then ditched the hovertank method for rattlers and received a faster time of :31. Hovertanks are much weaker than rattlers while rattlers are only slightly slower than hovertanks. We always did joke about doing a rattler run. Tom: Yep, we finish off the game with the best tank. Rattlers. Nothing really special, we run straight to Cassandra and kill her. Before, I had to do this crazy shot with the hover tank down an alley past a enemy to hit a building and grab a flamethrower and then dodge the enemy and...it was really annoying. Finally, if you own this game get to level 18 and just let your controllers sit on the floor(Again, may only be possible in co-op). You'll beat the level in about a minute, without doing anything. Contact us on SDA if you want to know anything about the game or our run. Handles are Phazonelite7 and Enkazin( I never post).